I have an M44 ready to go in to my E30. I am at least considering using all the M44 harness, ecu and ews and key from the donor car. I need a pin out of the connectors and maybe some advice from anyone that's deslt with obd2 swap info. I question whether my e30 tach will work, whether the check eng light will ever go out, whether it will run in closed loop and so on. I like the idea of a maf sensor over the afm and knock sensors esp since im up around 11.5 comp. I figure if I can look at the wiring schematic and what the pins are at the 3 connectors on the engine harness, I can figure out if its worth the effort. I see it quickly becoming a money/time pit. Is the car a M42 318i/is already? Car is already M42. I decided on just keeping the M42 electronics for now to avoid the complication. No reason to bar, it looks bone stock and the cam isn't enough to cause an issue. 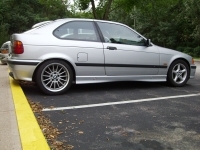 Sleeper Calypsorot 1996 318ti tintop. CA-legal swapped S52 from '98 M3, and ZF transmission with lightened flywheel/clutch. Magnaflow 2-into-1 muffler. Six-cylinder Eibach springs in front and 318ti H&R Sport springs in rear. Koni Sport adjustable dampers all around. Racing Dynamics 28mm & 19mm swaybars. M3 front hubs/brakes, E34 rear calipers, braided SS brake lines, Hawk HP-S pads. DS-II wheels. Polyflex purple bushings throughout, and factory lower x-brace. Fan delete mod. Engine mount reinforcements welded-in. 3.25 LSD rear diff from E28 & E30 axles. Does anyone know which pin on the DME goes to the OBDII data connector? The diagram shows pin 87 or 88 going to a 'data' connector but I'm not sure if this is the standard OBDII or the one under the hood. I appreciate the help. Huge thanks to Strawman, your pinout of the x20 made it possible. Which reminds me, I owe you a few more bucks for thst cluster, which, as it turns out, I won't be needing. But the Engine, DME, EWS and chip are all synced up and running beautifully. I'll admit, I had my doubts and when my power wire to the EWS popped off, causing it not to start, I almost panicked but it was a easy fix. The tach, and coolant temp even work. Last edited by benz-tech; 08-19-2015 at 06:58 AM. Update: after resolving an issue with a 5,500rpm fuel cut, the car just keeps getting better. I'm installing a Dakota digital speedo corrector for the second 48t speed input (e30 is 9t only) and a rear o2 bung. After that I should have no fault codes and will actually hook up the check eng light. COP kit installed. I Still a few bugs though, My idle is not great. The idle control is working as can bee seen by the bump when the car is moving. It acts like it just can't move enough air to feed the cams. Turning the ac on will kill it . It will also need a tune since the top end is lean. The lifters are noisy, and it could be that reground cam or the valves that were topped when they ground the faces. Either way, I have a full s52 33mm bucket and beehive spring upgrade in the mix and will inspect everything when apart. Hopefully just the lifters. Swaps are definitely complicated, but the results are well worth it. Great to hear you got it going! No worries about further reimbursement for anything I sent to you; I'm just glad the engine and related parts have gone to someone who could use 'em. I know this is an old thread, and my apologies for reviving a 4 yr old thread but since I'm new here, I can't PM you. I'm actually looking at doing the same thing. I have a 96 318ti with a Downing atlanta supercharger, and I'm wanting to put it in my 91 e30 318is. I want to keep the OBD2. Any tips/suggestions? I have a pretty complete build thread on m42club and buried somewhere on r3v too. Same username. I would also like to add that if you can use the g250 gearbox, use it. The ratios are much better. You’ll need a 3.25 out back if you do it. I imagine it would be amazing with a DASC. I had other issues to solve since I’m running an M42 head that you won’t run into. If for absolutely nothing else, the maf sensor fuel injection is much more responsive. But power adders always help. Good luck with the build. I think it’s worthwile. You should be satisfied with the added power of the DASC. Otherwise a straight m44 swap would be a lot of work for not much gain.